If you wear canvas shoes like Converse All-Stars or Keds, you know there's a point when they inevitably look like hell. They're dirty. They're smelly. They've lost a little of their life, even though Converse look their best a little worn-in. 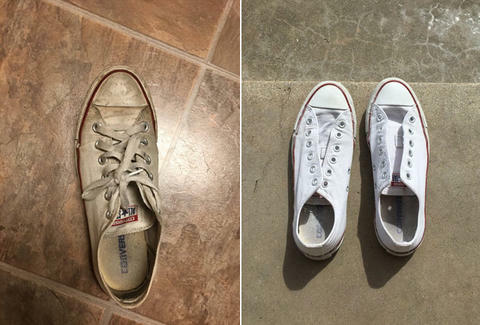 Sarah Tracy, a college student in Texas, shared a pair of pictures of her white Chucks on Twitter. In the first, the shoes have seen better days. It was shared with a side-by-side of those same shoes looking sparkling clean. "I am a miracle worker," she proclaimed. She was quickly inundated with questions about her method. It prompted her to share her personal cleaning recipe. It has now been retweeted nearly 100,000 times and favorited more than 319,000 times. Many were awestruck and took the advice to heart. For what it's worth, the Converse FAQ suggests you use "a damp cloth [to] rub gently with lukewarm water and mild soap." It also cautions against putting your shoes in the washing machine. (Most shoes don't handle that kind of treatment well, and if they do -- like with All Birds -- the company makes a point of telling you.) Converse's process is echoed by other online tutorials. Though, Tracey's advice isn't the only advice online that suggests the machine could work. Many others responded to Tracey's tweet with their belief that a good pair of Converse requires a few scuffs. Nonetheless, that "lived in" look can go a little too far. Sometimes your shoes are at the point where the only way forward is a thorough cleaning. If you get there, this is probably worth a try. Dustin Nelson is a News Writer with Thrillist. His last attempt to clean Converse involved a hose. Follow him @dlukenelson.